One of the effects of skyrocketing rent in any city is that the surrounding cities become cooler. Inexpensive space attracts artists who fill that space with work they can no longer afford to present in a city increasingly ransomed to luxury condo developers and corporate chains (Hello, Liz Claiborne). When San Francisco was cheaper, it was more known for its artists and writers, and Oakland, perhaps unfairly, for gun crime and blight. Now San Francisco is a city dominated by tech money rather than its former Bohemianism, and the Oakland Art Murmur, at least in terms of sheer exuberance, wipes the floor with any equivalent art event happening in what we arrogantly term “The City.” It’s been decades since one could imagine, for instance, a restaurant large enough for a mid-sized crowd and space for both dancers and a live band — and that was run by people who thought it would be financially viable to regularly present lesser-known ethnic dance forms set to acoustic instrumentals and singing in foreign languages. There is actually one restaurant in Hayes Valley, with both interest and space to accommodate such events, whose plans are rumored to have been felled by a single grumpy neighborhood resident who complained to the city that he didn’t want his ‘hood becoming “another North Beach.” To this we say, “We should live so bloody long.” Ah well, San Francisco, we can’t win for losin’. Well, San Mateo has it: On the third Friday of every month, Lebanese restaurant Tannourine hosts an evening of bellydancing, featuring FatChanceBellyDance and guests, often accompanied by live music by local North African band Helm. FatChance arose out of a Bay Area dance dynasty stretching back to the ’40s. 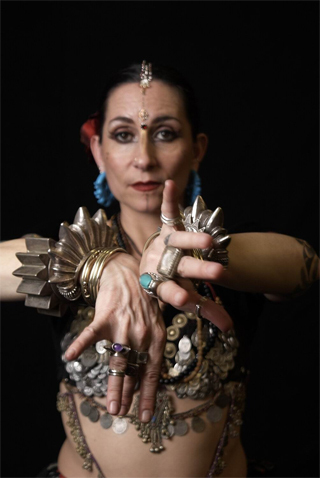 Jamila Salimpour collected folk dances and finger cymbal patterns from Morocco, Egypt and Turkey, while dancing in nightclubs in Los Angeles and her own Bagdad Cabaret on Broadway here in San Francisco. In those days successful clubs could import dancers from these other countries, and so Jamila was able to learn certain steps from other dancers who got them straight from “the source.” She developed a vocabulary for the basic movements and a teaching method to break them down for the American student, and began to teach classes in Berkeley in the ’50s. 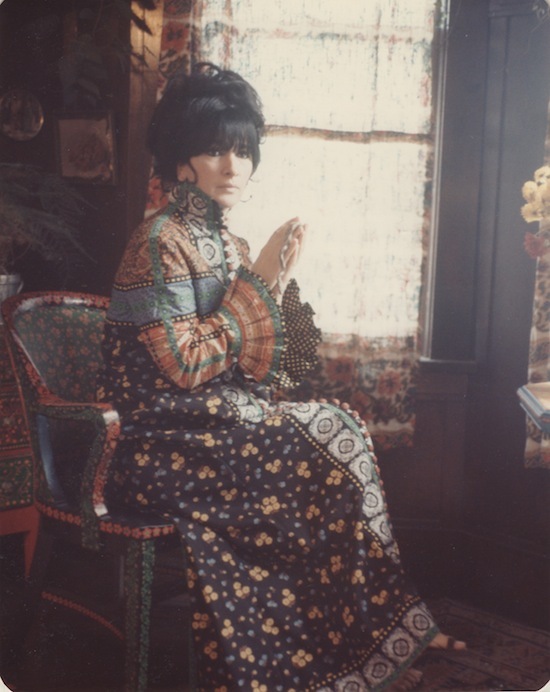 In 1968, she formed “Bal Anat” with her students, presenting the various folkloric dances and costuming at the Renaissance Pleasure Faire. 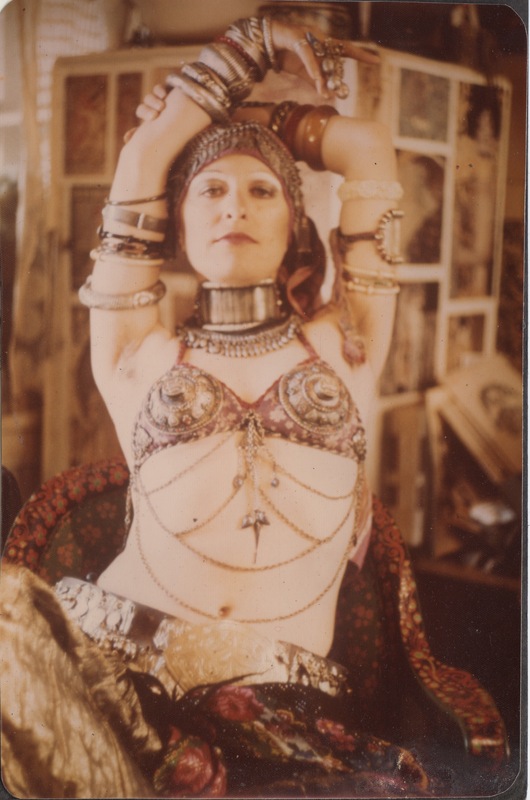 Salimpour’s daughter Suhaila now helms Bal Anat, but one of her other students, (and this author’s mother), Masha Archer, branched off to form her own group in the early 1970s, the San Francisco Classic Dance Troupe. While she shared Salimpour’s love of bellydance, she resisted what she felt was her teacher’s pessimism regarding the danceform ever having a life outside the nightclub and occasional theme festival (after all, even in the Middle East and North Africa, it had existed exclusively in nightclubs for decades and was not an artform its seminal cultures cared to preserve as anything but male entertainment. The original bellydancers, the Ouled Naïl, were Algerian Berbers who performed the danse du ventre for the French male colonists). Archer was also uninterested in authenticity for authenticity’s sake, and so described what she did as primarily an American style of dance derived from Middle Eastern and African folkloric roots. She altered steps to suit her taste and to make them, she felt, appropriate for the modern Western woman. She eliminated floorwork (basically what it sounds like, movements done on the knees or back) and emphasized balletic posture and fluid arm movement. She also furthered the dance’s reach by having her troupe perform at events that didn’t normally host Middle Eastern, or even any, dance performance. Her troupe danced at gallery openings, book fairs, city hall, the Cinco de Mayo parade, the San Francisco Photography Fair, even photographer Imogen Cunningham’s memorial (Archer’s own husband was the late photographer Charles Homer Archer), all part of her design to pull the dance out of the nightclub and into its rightful place as one of the great performance arts. Another factor in Archer’s quest to create distance between the dance and the nightclub was her emphasis on the chorus, rather than having a lone woman dance by herself, as was customary in the clubs. The chorus is a group of “backup” dancers onstage performing basic movements behind the featured soloists and duets. Believing that the audience could be taught how to regard the dance by the dancers onstage, that seeing the chorus support and respect the featured dancers would influence the audience to do the same, Archer surrounded her featured dancers with a half-circle of supporting dancers, or the “tribe.” Importantly, Archer also continued Salimpour’s tradition of dancing in folk-inspired costuming, rather than the bare legs and sequins of the nightclub acts. Wearing pantaloons, hipscarves, and piles and piles of ethnic jewelry, the San Francisco Dance Troupe looked like something out of an Art Nouveau fantasy. Archer’s troupe disbanded in 1986, and one of her students, Carolena Nericcio, started teaching, initially, simply to have people to dance with. Inevitably, she and her students started to perform. Nericcio and several of her dancers are heavily tattooed, and at first danced at tattoo shows and other festivals. Bellydance still had not shaken its more lubricious associations, and Nericcio had to endure predictably tactless questions such as, “Can I get a private dance?” and eventually named her troupe for her reply, “Fat chance.” She also began assembling the moves she inherited from Archer (and indirectly, from Salimpour) into a system that enabled dancers to better communicate with each other onstage, which ultimately allowed her to increase the repertoire of movements. Bellydance (at least this style) is an improvisational dance, and under Archer’s tutelage, dancers had to become so attuned to each other that they could just sense when one movement would change to another. Nericcio established a standard group formation, which placed the “leader,” at the front left of a trio or quartet of dancers. She also created a language of cues, which could be as conspicuous as a plunge of the arms or as subtle as the making — or breaking — of eye contact, and with which the leader could signal to the other dancers a change from one movement to another, or to a variation on the same movement, or a rearrangement of the group from which another dancer could assume the lead position. 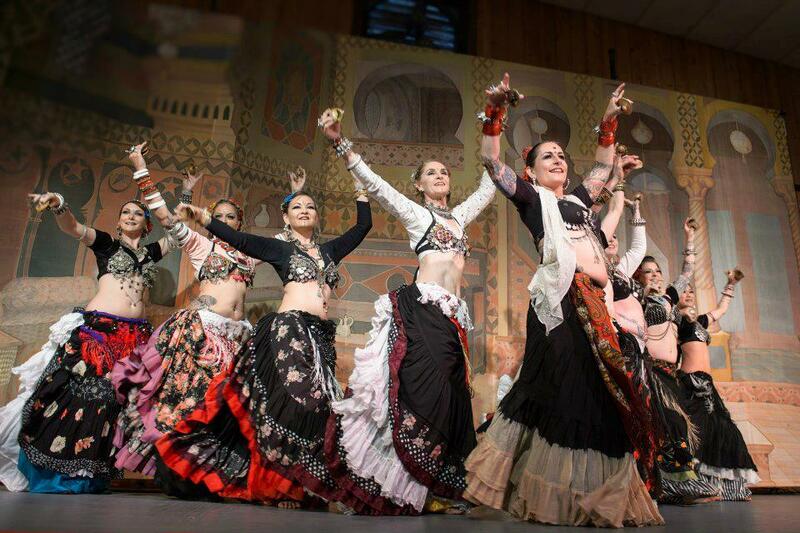 This entry was posted in ART, belly dance, dance, San Francisco and tagged American Tribal Style, Bal Anat, belly dance. San Francisco, bellydance, Charles Homer Archer, dance, Fat Chance Belly Dance, FatChanceBellyDance, Jamila Salimpour, Masha Archer, San Francisco Classic Dance Troupe. Bookmark the permalink. It was very interesting for me to read about the history of ATS in a bit more detail, as I perform Egyptian style myself (bare legs and sequins ahoy! ;)), but have a great deal of interest in how the dance has evolved into such a wide array of forms as it has spread around the world. Some of the ideas in ATS about staging, formations and chorus lines are really useful for anyone producing a bellydance show in any style, and I enjoy watching well-executed ATS. There are some aspects of Tribal dance that I’m slightly uncomfortable with though – especially, a tendency among some groups to present it as an “authentic, traditional” Middle Eastern cultural dance, rather than an American artistic creation (or to allow the audience to assume that this is the case based on the ethnic-looking costuming, and not educate them about what they are actually seeing).